I am always on the look out for great new additions to my ever expanding closet and I think I found just the store to help me with that. 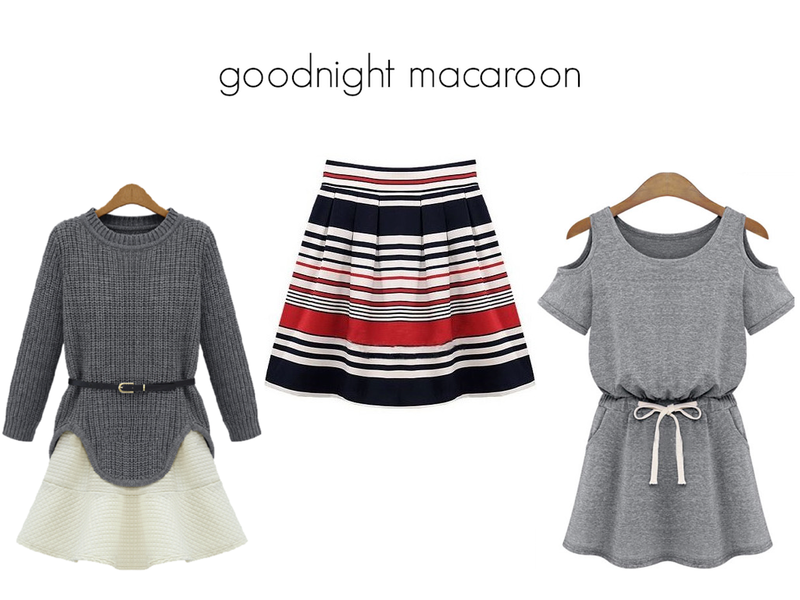 Goodnight Macaroon is known as an online store for women with exquisite taste. Well, who can argue with that? They have amazing pieces for affordable prices. These are pieces that have been worn by the likes of Olivia Palermo, Miranda Kerr and even Taylor Swift. (well, if it’s good enough for them…) As I glanced through page after page of their site, I started slowly building up a cart of likes and loves that I had to whittle down later to a reasonable number. I picked up three great new pieces to add to my wardrobe and was so pleased with the pieces I ordered that I have already added a ton more to grab in my next round of shopping. 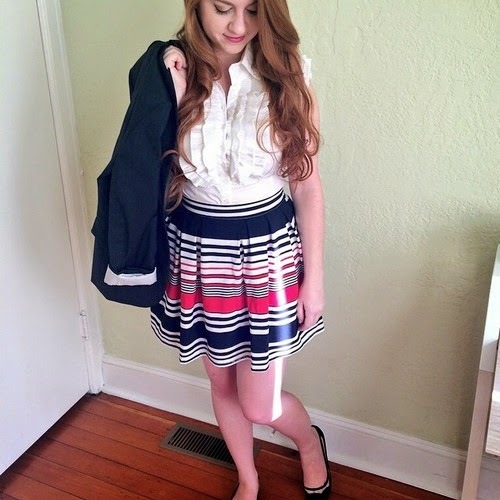 The first piece that I picked up was the Mixed Stripe Pleated Skater Skirt. It’s a great length for work and I love the combination of thick and thin alternating stripes in such bright patriotic colors. In this shot, I combined it with United Color of Benetton Navy Blazer, a flutter sleeve button down and Sole Society’s SAM pointed toe flats in black. Another piece that I picked up was the Crew Neckline Charcoal Grey Sweater Flared Dress. Although it’s a tad to hot to wear the Sweater dress just yet, the adorable grey sweater and white skirt can be worn as separates. It’s like two different outfits in one! I paired the white skirt from the dress with a Saint James striped tee, a Forever 21 tan trench coat and Ellemenno dark brown booties. Trying to get in all of my wearing of white before Labor Day! The last, and perhaps my favorite, piece from my Goodnight Macaroon haul was the Shoulder Cut Out Drawstring Jersey Dress. This dress is ridiculously comfortable and is super cute to dress up or down. It is the perfect outfit for end of Summer days. It also comes in blue, which I think I may also need to have for my comfy dress collection. In this shot, I paired it with Ray Ban Wayfarers and my favorite Sole Society Natalia Mini Bag, which is so versatile, it can be paired with almost anything! As for quality and price, Goodnight Macaroon has both. I was pleasantly surprised by the great quality of the pieces I bought and each of them was such a good deal. Goodnight Macaroon will definitely be one of my new favorites when it comes to online shopping. Have you checked out Goodnight Macaroon before? Know of any other great stores that I should check out? Let me know in the comments below!